Millions of Americans tuned in on Tuesday for the fifth episode of ABC’s “Roseanne,” the popular reboot of the beloved ’90s sitcom starring comedian Roseanne Barr as a working-class mom, which garnered more than 27 million viewers in its premiere late last month. The show, which has been reaching nearly double the viewers of its closest competitors, continues to dominate the ratings heading into its sixth episode. One of the most interesting aspects of its popularity is that the show hasn’t really changed. The popular culture around it, however, has changed quite a bit, such that a show that was considered edgy during its first run is now almost quaint. When “Roseanne” came on the scene in the late ’80s, it broke ground in featuring an “ordinary” American family whose problems — such as under-employment and sibling rivalry — were relatable. Strong family loyalty is a theme in the reboot as well. “You have this duality, of a family that constantly pokes each other in the back, but the poking stops the minute something gets serious for any member of the family,” said Tobe Berkovitz, a professor of advertising, popular culture and television at Boston University. In an age of ever-increasing cable channels and streaming services, many of today’s long-running popular sitcoms focus on singles and feature edgy, urban tribes rather than families — there’s Netflix’s “Orange is the New Black,” about inmates in a women’s prison; HBO’s “Silicon Valley,” about single tech entrepreneurs in a cutthroat industry; and Netflix’s “Master of None,” featuring an Indian-American singleton looking for love in New York. And a new genre — including shows like HBO’s “Divorce” and ABC’s “Splitting Up Together” — has cropped up to offer darkly comic, often racy views of life after divorce. “Roseanne” — once a challenge to TV’s idealized takes on the nuclear family — now seems, ironically, among the more family-focused and traditional. And in 2018, a time of great political turmoil in America, perhaps “Roseanne” is here to remind us that family holds this country together. This time around, the Connors are facing issues that reflect our time: DJ’s military wife is deployed overseas; Becky, a single, childless woman in her 40s, is confronting her waning fertility; and Roseanne, who voted for President Trump, and her sister Jackie, who favored Hillary in the election, have been, like most of the country, at odds over politics. But while the show’s initial episodes portrayed family disagreement, they also made sure to underline the fact that, in their own bumbling, imperfect ways, the Connors have each other’s backs. In the double-episode premiere, Dan gave his grandson Mark — a junior-high-school-age boy with a penchant for wearing feminine clothing — a pocket knife to protect himself at school. Dan might be an old bull whose political and cultural leanings are portrayed as conservative, but he cares more about Mark’s safety than debating the highly politicized subject of gender fluidity. In this, the show reflects an important truth: Only the most hardened partisan would prioritize politics above family. 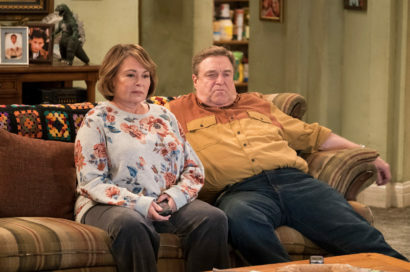 Indeed, the show’s premiere gave America a front-row seat to Roseanne and her sister Jackie’s political sniping and reconciliation. On the contrary: Perhaps we can take a cue from “Roseanne” that, regardless of what our personal beliefs may be, family (still) comes first. This entry was written by Heather Robinson and posted on April 23, 2018 at 7:01 pm and filed under Features.